FCC Class-B Certified; FCC ID "M5ZHA2". CAT-5 twisted pair up to 100 Feet, 10 devices. No external power required on true RS232 ports. External power connector for non-standard ports. TMEX compatible using DS9097E driver. Power boost provision for DS1820, DS1920 temperature conversion requirements. 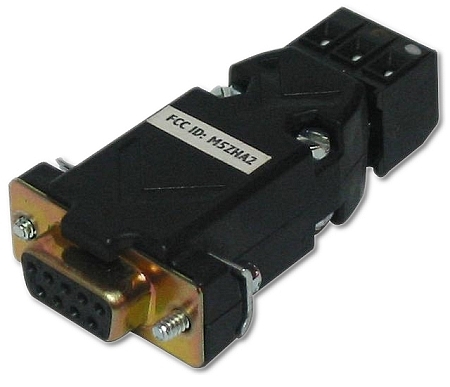 The HA2 is a RS232 to 1-Wire adapter. Designed to mate with the DB9 RS232 port of a PC, this RS232 powered converter provides the necessary level conversion from RS232 to 1-Wire device levels. When CAT-5 twisted pair cable is used, the HA2 can drive up to 10 1-Wire devices at cable lengths of up to 100 feet. The HA2 is recommended for applications where FCC Class-B certification is required. The HA2 requires very little power. When the host PC can provide standard RS232 levels, all the required power is derived from the DTR line. In cases where the DTR is not available or the RS232 port is non-standard (low power notebook), the HA2 can be powered externally. External power is applied between the power (+) and the DB9 shroud ground at the PC. Boost current for DS1820, DS1920 temperature conversion is provided by RTS switching so that parasitic temperature conversion is supported. The HA2 is supported by the EDS OneSix DDE server driver. Our website has a minimum order value of $25. At two pieces, you would surpass that threshold.